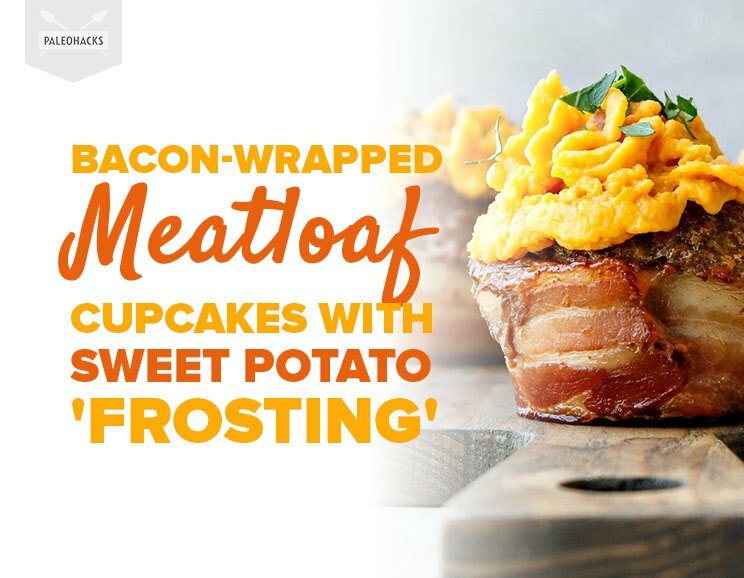 Upgrade your classic meatloaf with these bold and smoky bacon-wrapped meatloaf cupcakes, topped with a decadent sweet potato frosting! 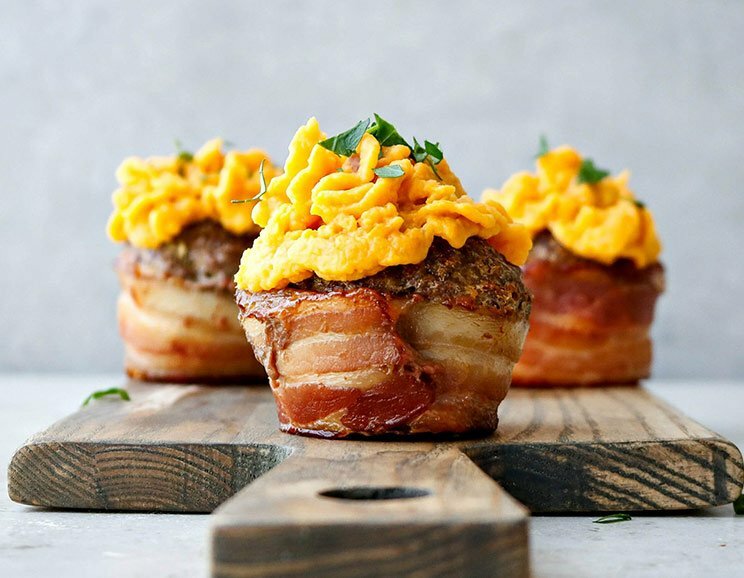 Satisfy your hunger with these hearty meatloaf cupcakes wrapped in savory bacon and topped with mashed sweet potatoes. It’s an all-in-one meal that comes perfectly portioned into grab-and-go servings. 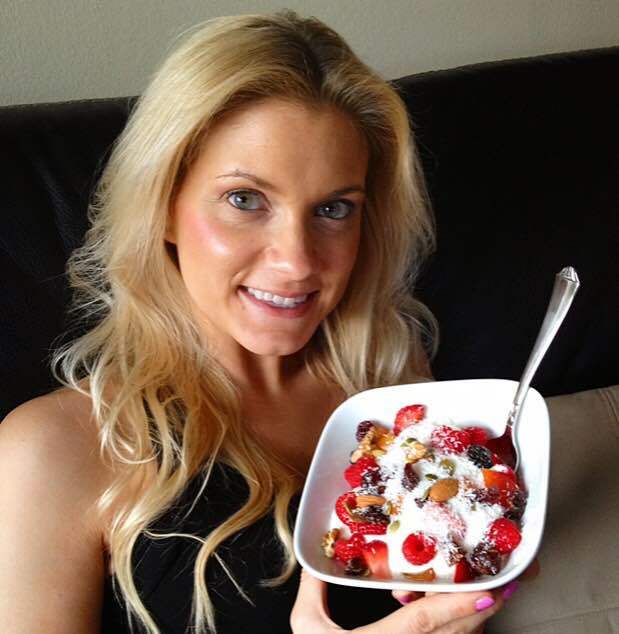 Make them ahead of time for easy meal prepping or impress your guests by serving them at your next gathering. 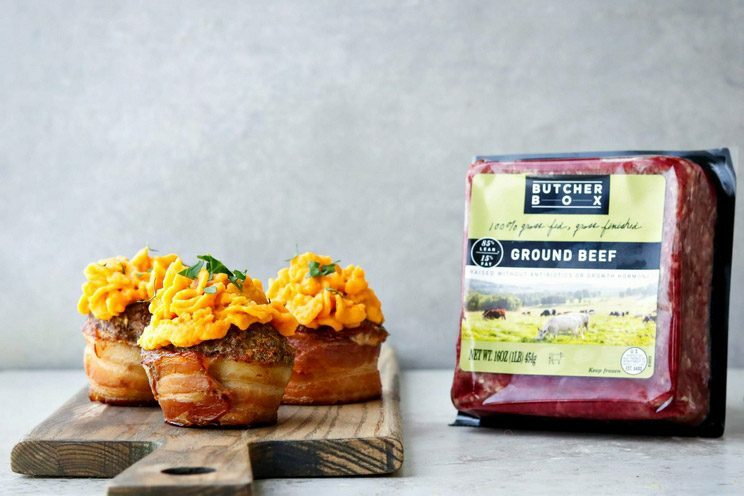 To achieve the perfect meatloaf cupcake, start with pasture-raised, sugar-free, and uncured bacon. This type of bacon eliminates harmful additives (like nitrates and refined salts) and cooks into wholesome smoky goodness. Tip: Be sure to use thick-cut bacon so that it’s durable enough to be used as a wrap. Grass-fed beef is also used in this recipe and is more nutrient-dense than conventional meats containing harmful antibiotics. Conjugated Linoleic Acid (CLA) is a major cancer-fighting nutrient found in pasture-raised meats and can even help reduce inflammation. (1) Added almond flour will help bulk up the meat, creating a crunchy texture similar to breadcrumbs. Get started by wrapping a strip of bacon around the inside of six muffin tins. Make sure to overlap the ends so that it fits neatly within the tin. In a large mixing bowl, combine the beef, egg, almond flour, onion, garlic powder, oregano, sea salt, and black pepper. Mix thoroughly and form the mixture into six large meatballs. Gently press the meat inside of each muffin tin to secure it within the bacon. Next, place the muffin tin onto a baking sheet and bake for 30 minutes. Note: The baking sheet is used to catch the grease drippings that may run off during the baking process. After the baking is complete, remove the cupcakes from the oven and gently lift them out from the tins. Use a clean sheet of parchment paper to line the baking sheet and place the cupcakes back on top. Return them to the oven and bake for 15 minutes, or until the bacon turns crisp. In the meantime, peel and chop the sweet potatoes into coarse chunks. Transfer them to a medium pot filled with water and cover. Bring to a boil and continue cooking until the potatoes are soft. Next, strain the water and mash the potatoes until smooth. Tip: Add sea salt or ghee to the potatoes for extra flavor. Spoon mashed potatoes into a piping bag and attach a frosting tip to the end. Set aside until the cupcakes are ready for decorating. When the cupcakes are finished, let them cool for five minutes and “frost” with mashed sweet potatoes. Upgrade your classic meatloaf with these delicious Bacon Cupcakes and enjoy a bold smoky flavor, and decadent sweet potato frosting. Preheat the oven to 350ºF. Neatly tuck a strip of bacon around the inside of six muffin tins. In a large mixing bowl, combine the ground beef, egg, almond flour, onion, garlic powder, oregano, sea salt, and pepper. Mix thoroughly. Evenly divide the meat mixture into six balls and gently press into the center of each muffin cup. Secure it to fit neatly within the bacon wrap. Place the muffin tin onto a baking sheet and bake for 30 minutes. Carefully remove the cupcakes from the tin and transfer onto the same baking sheet lined with parchment paper. Bake for an additional 15 minutes to crisp the bacon. In the meantime, chop the sweet potatoes into chunks. Place them in a medium pot filled with water and cover. Bring to a boil and cook until soft. Drain the water and mash the sweet potatoes with a fork. Place into a piping bag and attach a frosting tip on the end. Set aside until the cupcakes are ready to decorate. When the cupcakes are finished, let them cool for five minutes before topping with mashed sweet potato “frosting”.